3 Bedroom / 3 Bath - LUXURY Oceanview at the Mar Vista Grande, located in the prestigious Ocean Drive area of North Myrtle Beach. Relax and unwind on the spacious balcony of this three bedroom, three bath condo with a phenomenal view of the Atlantic Ocean. 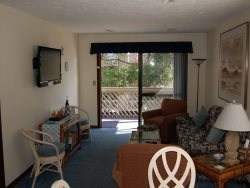 Located in the heart of family-oriented North Myrtle Beach this condo is easily accessible to major local attractions and enticing events are just walking distance to Main Street. Feel at home with an elegant king-sized bed in the master, while your party enjoys two queen beds in the spacious second bedroom. Another bedroom also offers two full-sized beds to accommodate up to ten guests. Perfect for relaxing and entertaining, this condo has exquisite amenities including a fully equipped kitchen with granite countertops, modern appliances, and washer / dryer. It also has four large TV’s Be sure to take advantage of the large fitness center, indoor / outdoor pools, multiple Jacuzzis, and a lazy river. This unit does not allow access to owner’s storage.